Once I tried these cookies the first time, I knew the recipe was a keeper! I tend to enjoy cookies of the chocolate variety. I know, you’re completely shocked by this news. However, last year when I made my cookie trays, I thought the chocolate was a little bit overwhelming to the non-chocolate choices on my trays. What if someone doesn’t like chocolate? Then they’d only have two of my cookies to choose from: Snickerdoodles and Oatmeal Scotchies. I felt like I needed another option for this year’s trays. I wanted something easy, something without a ton of ingredients or steps. 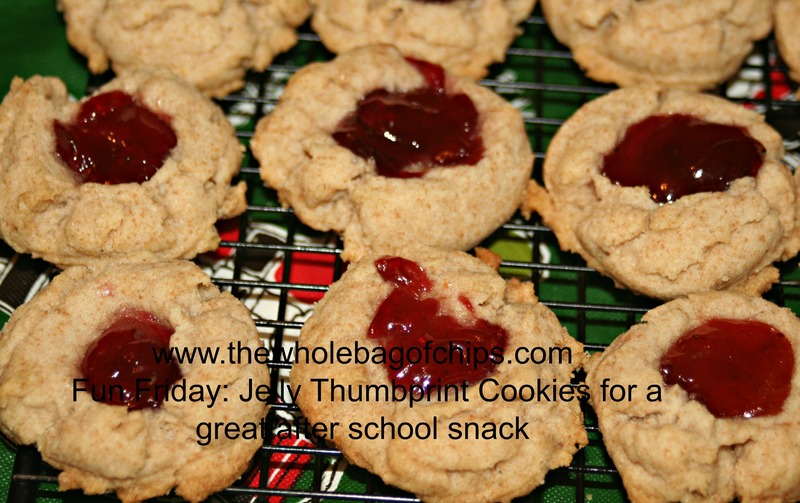 Enter the Jelly Thumbprint cookie. I had a Chocolate Thumbprint cookie, but these would be completely different, other than the thumbs. I went to Allrecipes.com and found this recipe, and modified it to suit my own needs. I made it a little bit healthier, with the addition of some wheat flour and by using I Can’t Believe It’s Not Butter. I didn’t want the peanut butter glaze, so I just left them plain. I first made them as an after school snack, making half with strawberry jelly and half with grape. The kids loved them so I decided they’d make it onto the trays. This year I’d been invited to participate in a cookie swap, so I made a double batch of these, using half for the swap, some for a Christmas party we were going to, and the rest for my trays. They were a hit, all around! This is a cookie that can be made for my family throughout the year, and I intend to make them a permanent addition to my trays in the future as well. Below is the recipe from Allrecipes.com as it appears on their site, along with my modifications. If you’d like to make them with the peanut butter, you can try that as well! 1. Preheat an oven to 350 degrees F (175 degrees C); line a baking sheet with parchment paper. 2. Beat the butter and sugar with an electric mixer in a large bowl until smooth; add the vanilla and continue to beat. Mix in the flour mixture until just incorporated. Roll dough into 1 1/2-inch balls and arrange on prepared baking sheets. Make a small hole in the center of each ball, using your thumb and finger; fill the holes with grape jam. 3. Bake in the preheated oven until lightly browned, about 14 minutes; allow to cool on baking sheet for 1 minute. 4. Put the peanut butter in a microwave-safe bowl, and cook in a microwave oven until soft for 10 – 30 seconds, checking every 10 seconds. Be careful not to overheat the peanut butter; do not let it bubble. Stir the vegetable oil through the heated peanut butter; drizzle over the warm cookies. Categories After School Snacks, Christmas Cookies, dessert, Jennifer L. Cowart, Kids, Lowfat/Nonfat, Your Tray or Mine? 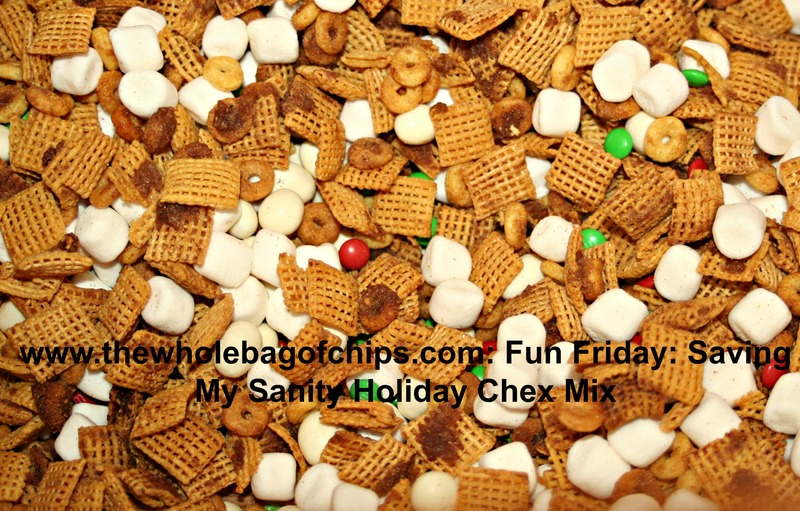 This Chex Mix recipe literally saved me this year. I filled an entire laundry basket with gift bags, plus a Tupperware Cake Taker full of the mix itself. I think we’d all agree that the holidays are much more enjoyable when you’re not totally and completely stressed out. That being said, this school year, the holidays and the treat-giving season that goes along with them, had the potential to put me right over the edge. And really, as a working mom of three this time of year, that edge is awfully close most of the time anyway, so I really didn’t have far to be pushed. Normally, I’m a cookie baker at Christmastime. Between my mom and I, we bake over a dozen different types of cookies, creating cookie trays for our family and friends. As a mom of three, I have always given all of our kids’ teachers a cookie plate at Christmastime. I also have given one to the secretary, bus driver and bus monitor, teacher aides, principal and I make a tray for the faculty room. I also treat the staff at my husband’s school to a tray of cookies in the teachers’ room, and then I make them for our family as well. It seemed doable when my oldest was first in school, and even when two were in school. It started to get a little tougher when all three were in school, as well as my husband at his own school, but I continued on. Then last year came middle school. SEVEN TEACHERS. A whole new set of office staff. A principal AND an assistant. TWO secretaries. I’m not sure where that theory came from, but I will say I used to BE a middle school teacher, and I love cookies, but more than that, I liked being thought of at this time of year just as much as when I was an elementary teacher. My daughter didn’t want to stop our treat-giving tradition, and I couldn’t find a good reason why she had to. And she didn’t want to leave any of her teachers out. So we didn’t. This year, my husband has a new job at a larger school. I knew something had to give. I was not going to be able to do it. There wasn’t any way that I could possibly make enough cookies for all of the teachers and staff in all three schools and my family, and keep my job. Or my sanity. I’d be baking all hours of the day and night for weeks to make that happen. There had to be another answer. Simple, affordable ingredients, few dishes to wash. A win-win! Enter The Tailgateista and her Homemade Crock Pot Apple Cinnamon Chex Mix. That’s right. I said CROCK POT. That was the answer to my problem, thanks to my Crock Pot partner in crime, Gina, who was also searching for another solution to the gift-giving issue. She’s the one who found this recipe and sent it to me. We both decided to go with Chex Mix gifts this year, although we each chose a different mix to make, and today, as I type this three days before the last day of school before the vacation, I can honestly say that this saved my sanity. My gifts are done. Cooked, cooled, bagged, tagged and ready to be handed out on Friday, the day you’ll be reading this. And I still have my job and my sanity, thanks to this recipe from The Tailgateista. I doubled her original recipe and made a few modifications to it, to serve my purposes. I will put her recipe and my modifications below. I doubled the recipe SIX TIMES. That’s right, six times. 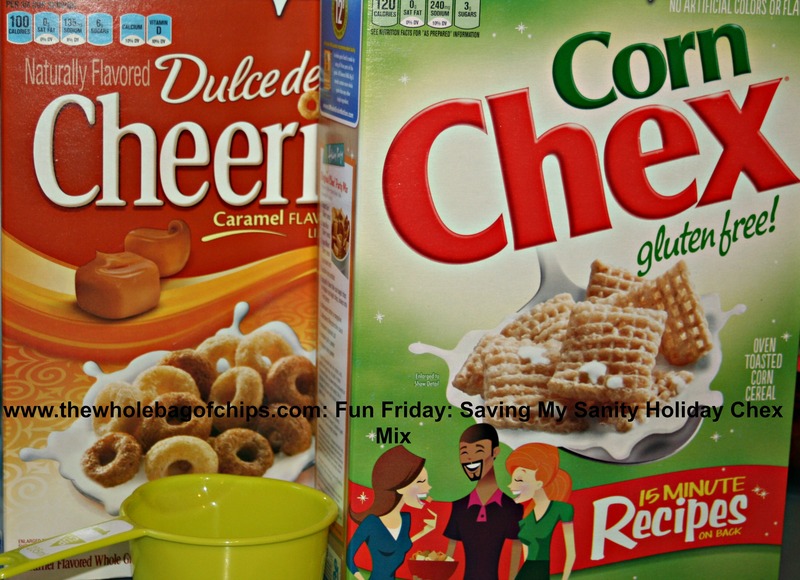 72 cups of cereal, and the equivalent of 48 two-cup gift bags of Chex Mix. And the best part of all? Not only is it a very cost-effective gift, but it cooks while you accomplish other tasks!! For me, a journalist who works from home a good part of the week, I could type all day and my gifts were cooking themselves over in the crock pot behind me as I worked. Or, if I was working away from the house all day, I could throw in a batch at night to cook itself while we worked on homework and showers and cleaned up from dinner. Some days, I did both: a batch in the daytime if I was here, and a batch again in the evening or after school. I’ll still be making Christmas Cookies this weekend, all our favorites, and I’ll still share them amongst our family and some close friends, but I won’t be cooking over the mixer and oven,rolling and frosting, baking and cooling late at night for a week in between working and parenting obligations, and still not having enough cookies to go around. We’ve found a way to thank our teachers and staff members for their time, talent and hard work without pushing me over the proverbial edge the week before Christmas. I even had enough gifts to give out extras to people I have always wanted to give cookies to, but didn’t ever have enough! Below is the Tailgateista’s recipe and my modifications follow below it. Give it a try, it’s delicious! 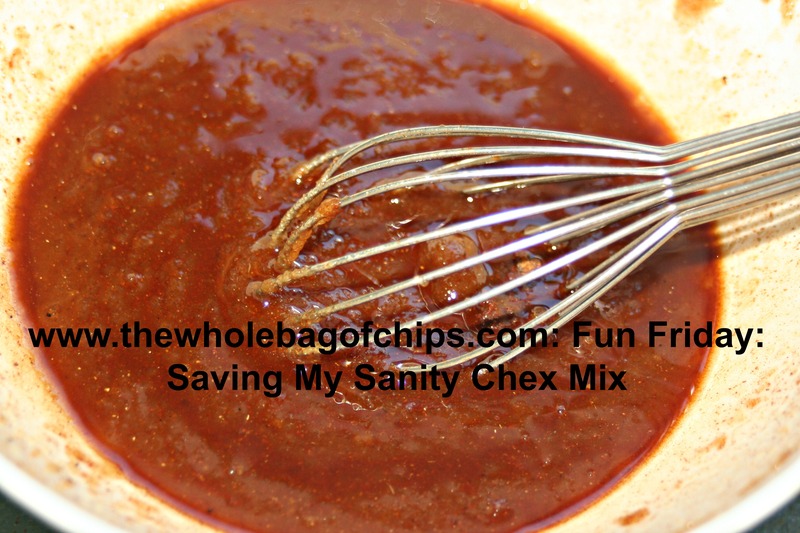 Maybe this Chex Mix will be the key to saving your sanity too! ***You can also add Pecans, M&M’s, any other candy,dried fruit or nuts!! * In a microwave combine all spices, sugar and butter until it is melted. I used I Can’t Believe It’s Not Butter instead of real butter, which makes this a bit lower in fat. 3) The butter should read 1/4 cup for a single recipe, in my opinion, not stick. I used 1 stick per double recipe. 4) I opted not to use the apples, because the first time I did a trial run, they burned. 5) I did not stir the Chex Mix in my trial run, which may be the reason why the apples burned. In every subsequent time however, I stirred the Chex Mix every 45-60 minutes while it cooked for the 3 hrs. 6) For my mix-ins, I used 1/2 bag of mini marshmallows, 1/2 bag of red and green mini M&Ms, and one full bag of white yogurt covered raisins, per double recipe. 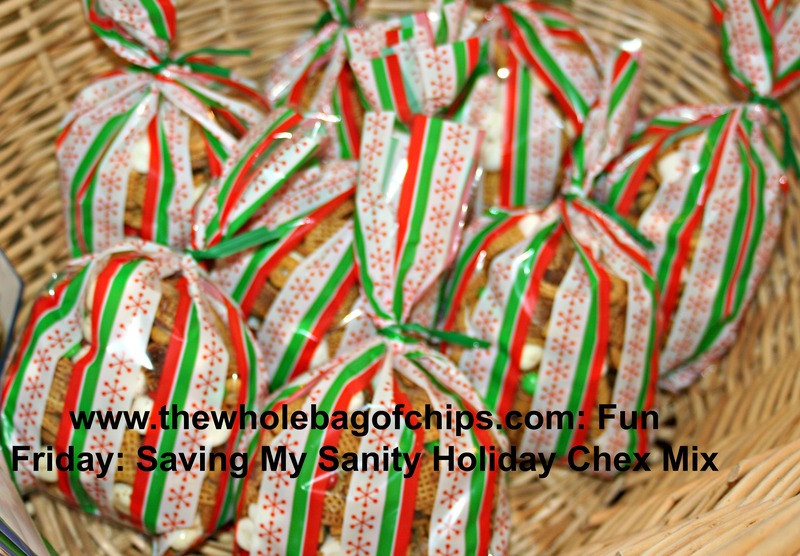 7) Each double recipe with my mix-ins filled eight gift bags. For my husband’s school, I filled a large Tupperware Cake Taker, normally used to carry layer cakes, with an entire double recipe, just for his faculty room. I sent in small plastic drinking cups for them to eat it out of. Although cost is not always the deciding factor in gift-giving, it’s certainly taken into account. I think most everyone sticks to a budget when shopping for gifts. With each of the six double recipes yielding 8 two-cup bags of mix, and my ingredients costing a total of $40.68 for all six batches (I used coupons for the M&Ms and the cereals), these 48 gifts cost me $.85 per bag to make. I spent just under $2.00 on two packs of 20 gift baggies to put them in. Even still, that cost me less than $1 per gift. Over 100 people will be enjoying my Sanity Saving Chex Mix this weekend, and I was able to accomplish it relatively stress-free and budget-consciously. Have a great Christmas everyone!! Categories After School Snacks, Christmas, Christmas Cookies, Eating on a budget, Jennifer L. Cowart, Recipes, Shopping on a budget, Your Tray or Mine? A new grab-and-go idea from my friend Gina! I love social media and the ability to find new ideas from people who’ve either thought of them first, or tried them out first, and been successful. Recently, our friend Gina had shared that she has successfully made ahead and frozen egg sandwiches as a quick grab-and-go breakfast either for school days or camping trips or whenever they’re most needed. She uses Bagel Thins and her family loves them. I decided that this school year, as soon as I had some time, I’d try out her idea for my family. I always have great intentions, and I can’t always do something like this all the time, but I figure that any time I can be prepared ahead of time, is better than not. Eight bacon, egg and cheese sandwiches were ready to go. This past weekend, I was able to get the Bagel Thins and give this a try, and I was so happy when my daughter was able to grab a quick egg sandwich for her breakfast later on in the week, deeming the meal a success. Gina’s instructions were simple: be sure each part of the sandwich is fully cooled, and wrap in paper towels for reheating. The Bagel Thins bag makes for great storage in and of itself, so I just cooked, cooled, wrapped, labeled and froze. As I was cooking, my daughter Liz was so excited and before even trying one out, she requested sausage patties for the next time around, so I knew she had high expectations for this trial. I used precooked bacon to cut down on some of the prep time (one slice cut in half per sandwich), and I used my counter-top griddle to cook the eggs all at once. I was able to cook six and then two. I cooled them all on a cookie sheet, which I’d popped in the oven for a couple of minutes first, just to fully melt the cheese. I hope that I can continue this meal prep idea as it gives us an additional breakfast or on-the-go meal for those times when we want something filling and don’t have a lot of time to make anything. Storing these right in the bag was super convenient. I appreciate the sharing of ideas from all of my family and friends, and I love this idea from Gina. I hope that we can continue to make these throughout the school year, along with other grab-and-go ideas for those busy days and nights. I encourage you to give it a try too, if you’re looking for something new for your own family’s busy schedule. This recipe took at least five tries and a lot of perseverance to perfect. Early this winter, I saw a cooking contest pass by in my newsfeed on social media. A local New England applesauce brand, Simply Wholesome–recently re-branded with a new name: Our Family Garden– was sponsoring a cooking contest. The participants would receive a six jars of their applesauce (two each of three different varieties) and they could submit as many recipes as they wished, as long as they utilized the applesauce in their recipes, which had to be previously unpublished, original recipes. We love cooking contests here, we have won several of them between us, and I decided to enter the contest. The winter months are a little bit slower for me work-wise than the spring and there was enough time allotted for some trial and error as I went about figuring out how to create an original-never-been-published-before recipe. My box of applesauce arrived within a few days of letting them know I’d be entering the contest. I was shocked to find six, full-sized samples of applesauce in the box, along with a jar of their blueberry jam as a gift for entering. I had already decided that I wanted to try to create an apple pie type of muffin with a streusel topping. I just had to come up with a recipe and incorporate the applesauce. I began researching basic muffin recipes so that I could see what ingredients I needed and approximately how much of each it takes to make a muffin, a muffin. Then, I added in their cinnamon applesauce, at first adding it in just to the actual muffin mix, to give them the apple pie flavor I was hoping for. As I created my streusel topping, my youngest daughter, who was home and doing a lot of cooking at the time, suggested that I add the applesauce to the topping as well. I thought that was a brilliant idea. I was creating a topping that included brown sugar, butter, quick oats, and now the applesauce too. My entire recipe was gluten free, using gluten free flour and gluten free oatmeal as well. I made the muffins, following the recipe I’d come up with. We waited with great anticipation for them to come out of the oven. It was very exciting as we watched them cook through the window of the oven. This wasn’t quite the result I’d been anticipating. As we looked inside though, we saw a big mess. The muffin topping was oozing all over the place. They tasted delicious, but they were a mess. The topping was oozing and the centers were sinking. I hadn’t thought about the fact that this really might take more than one try. My family said the muffins were good enough to try again, so I did. Now I’d gone too far in the other direction. I was determined to get this recipe right. Although the first time I made them they were too wet, by the fourth time I’d added in flour to the topping and now they were too dry, and my kids were beginning to dread coming home to the latest “after school snack” or waking up to a Saturday breakfast “surprise” of apple pie muffins—again. I was starting to run out of time and out of willing tasters. I talked with my mom multiple times to get her opinion, and I thought and thought about my recipe ingredients and what seemed to be working and what didn’t. What was I doing wrong?? Over and over in my mind I thought about all of the times I’d learned about scientists and how their hypotheses weren’t always right and how their experiments didn’t always work the first time around and how the learning takes place in the trial and error process, not necessarily in getting it right the first time around. I was feeling like a kitchen scientist, albeit a weary one. How long did these scientists take to perfect their experiments?? The contest deadline was coming up. I’d had about two months to get this recipe right and I was not going to give up. I wasn’t even in it for the win any longer, I was in it for the personal satisfaction of accomplishing this task of creating my own recipe for the first (and possibly only) time ever. I wanted it to be good, I wanted my husband and kids to like it and be proud of me, and I wanted to get it right. I like to get things right. I like to give 110 percent all the time. I gave it one final try. I adjusted my ingredients one last time. I begged my family to give them one last taste. “I hope you get them right this time, they’re good, but I don’t think I can eat another one any time soon,” my oldest daughter said. If I didn’t get the topping right this time, I really thought I might give up. I put what I hoped would be the final batch in the oven, and I held my breath, literally. I’d added in raisins to one of the trays on the advice of my mother and two of my kids who like them, and left one without, for the one who doesn’t. I watched them cooking in the oven. The topping seemed to be doing what it was supposed to be doing, spreading out without oozing over, and didn’t seem overly dry. Could it be that I’d finally gotten the right balance of every ingredient down?? It seems that it could. I’d figured it out. I think I cheered out loud. I pulled them out of the oven, and everyone took a bite. Again, I held my breath and waited for their responses. Five thumbs up from my family. Apple Pie Muffins with a Sweet Streusel topping for the win. I didn’t win one of the top three cash prizes that seemed attractive at the time I started out in this process. But, I won a lot more than that. I can proudly say that I have created a recipe, my very own recipe, that was delicious, and most importantly I did not give up. I never anticipated this would take this long. I generally don’t have the patience to stick with something this long and see it through, but I could not let this one go, and I’m glad I didn’t. Additionally, I have to say, we fell in love with this applesauce. I submitted a second recipe to the contest for Zesty BBQ pork chops which also utilized one of the varieties of applesauce, and my kids were going through the six jars like crazy, each variety was just as good as the last. I always have been a homemade applesauce kind of girl, and I have never purchased an applesauce my family has loved this much. I’m glad that we don’t live far from the Big Y markets in Massachusetts where it is going to be on the shelves under the new branding. It’ll be worth the ride just over the state line to get more. Not to mention, I recently ordered a case of their jams, as my youngest daughter finished the entire jar of blueberry jam on her own. When I heard that there were two other varieties, I decided to place an order for them. In the end, I gained much more from this experience than I ever imagined I would have, and I have no regrets about entering, or about not winning. Sometimes it just not about the win, it’s about the journey. Optional: use only one apple and add in 2/3 cups raisins. *to make gluten free, use gluten free oats and gluten free flour. 1) Preheat oven to 425 degrees Fahrenheit. Spray 24 muffin tins with nonstick cooking spray. 2) In a large bowl whisk together flour, sugar, baking powder and salt. 3) Add in eggs, milk and applesauce. Mix until well combined. 4) Add diced apples (and raisins, if desired) and mix well. 6) In a separate bowl, mix together streusel ingredients. 7) Add one teaspoon of topping to the top of each portion of batter, spreading across top of batter. 8) Bake for 15-18 minutes or until toothpick inserted into center of muffins comes out clean. I added a fourth ingredient…can you guess what it is? Happy Friday to you all. It’s been a little bit since I did a Fun Friday post, so I thought I’d share a fun one with you this week. My whole “after school snack” routine has gotten a bit derailed lately, mostly because many days no one is coming right home after school, which makes me really the only one who is home and hungry and means I’m always throwing an extra snack into everyone’s backpack to get them through the day. They eat lunch so early in the morning at school that they are starving by 3:00. Additionally, since my youngest has had to go gluten free a little more than a year ago, one of the things she often takes for lunch is muffins (gluten free, obviously). That knocks off a good 3/4 of my go-to after school snack ideas. I love muffins and I loved making them to eat after school because then we have them for breakfast the next day, if there are any left. Now, out of convenience, I buy six packs of freshly made muffins, four varieties at a time every couple of weeks, at our local gluten free bakery, A&J’s, and I freeze them. By the time she eats lunch they have thawed. I try to make my snacks healthy as often as I can, and so in going gluten free, I’ve relied on many dips (like this one from 2012 or this one from 2013), cheese and apples, fruit platters and the like. However, I did find a go-to cookie recipe that is fast, easy, healthy and gluten free, as long as you have gluten free oats, which I always do (thanks Bob’s Red Mill!). I have seen this recipe on several sites, and the one I am sharing today is from Recipe Diaries. I have seen versions of these cooked in the oven and I have even seen some that are microwaved. I have only ever cooked mine in the oven. 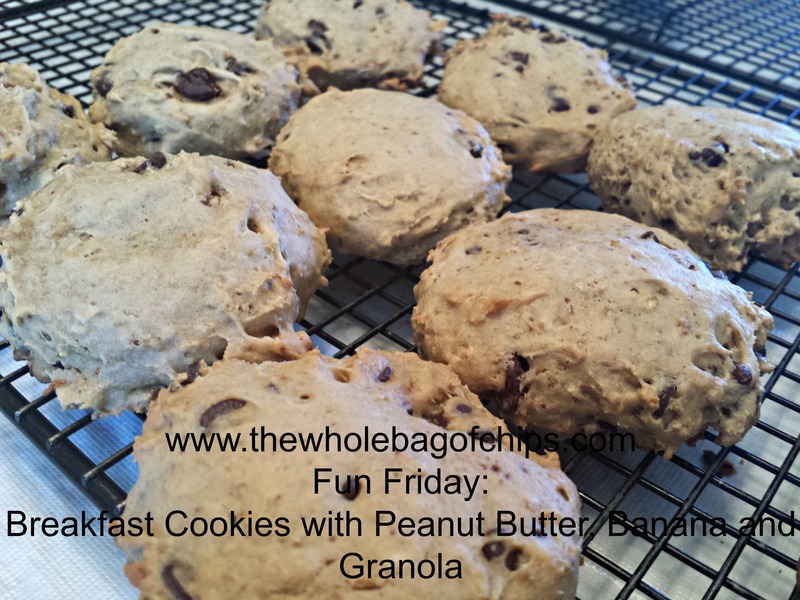 This week when I made these, I used 3 bananas and 1 1/2 cups of oats to make more cookies. I am also partial to Craisins over raisins, so I used a box of Craisins that is the lunchbox snack size (mostly because that’s what I had on hand) and it was the perfect amount. I’m also VERY partial to chocolate chips, so I threw some of those in too. In the past I have subbed dried pomegranates for the fruit and they were tasty too. Almost anything goes. I have always tried to make my kids aware of serving sizes when it comes to food, and they always ask me how many or how much of something they are allowed to have, especially when it comes to something like muffins or cookies. With these, it’s nice to know that although they still can’t have an unlimited amount, at least the ones they are having are really pretty healthy, overall. They make a great snack and they satisfy my craving for a little something sweet. I encourage you to try out the recipe at Recipe Diaries, and have a great weekend! Perfection! How did we do it? We can’t be the only ones who have this problem: we love hard boiled eggs for breakfast or for a healthy snack option, but every time we boil up a dozen we never know if they will be easy to peel and eat or if they’ll be a big battered mess of shells and whites. Recently I was at a dentist appointment with Elizabeth and the television was on while we waited. We were watching The Rachel Ray Show and the featured guest was a chef who was talking about his trick for making the perfectly peel-able hard boiled eggs. My daughter and I took note, and I texted myself his instructions. Which method would work? Cover and refrigerate or shake, shake, shake to peel? In a nutshell (eggshell?) he said to cook the eggs in boiling water for 12 minutes, and then to take them out and put them in a container, covered for 30 minutes in the refrigerator before peeling them. In the meantime, Liz had seen a different video online that showed another completely different method of peeling the eggs that told cooks to put their freshly boiled eggs into a covered container and shake them vigorously, at which time all of the shells would come off easily. This method of shaking the eggs to peel them seemed too intriguing not to try it out. One Friday afternoon after school I had a request for hard boiled eggs, and I had the time to do it, so we boiled them up. When it came time to cook them, we remembered the episode of Rachel Ray from the dentist office visit, and Liz remembered the video she’d seen online about shaking eggs. We decided to try it both ways. We boiled up one dozen for the 12 minutes that the chef on Rachel Ray had suggested, and then we split them into two groups of six eggs each. The first six went into the covered container and into the refrigerator. I set the timer for 30 minutes. We used that 30 minutes to experiment with the shaking of the eggs method. This was fun. Messy at times, but fun. And, as with any science experiment, we had to try this method several times, and we had some unusual outcomes mixed in with our results. First off, for the shaking I used some small, square covered containers from the dollar store that I had on hand. We cracked two of them in the process and had to throw them out. So, if I were to do this again, I’d use a better quality container for shaking. Luckily it was a multi-pack, so we had lots of them for our scientific trials. We ended up marking our egg with a Sharpie to see if it was the same one not cracking each time or not. It was. Second, we found the oddest thing in our results: one egg would crack perfectly, and one would not crack at all. It seemed to be the same one not cracking at all, and we could not figure out why. It was the strangest thing to open the case and see one egg whose shell was completely shattered and off the egg, and one completely untouched. We decided to mark the egg with a Sharpie marker to see if it was the same egg each time, and it was. We still don’t know why. Ultimately, when we peeled it separately, it peeled fine, so there were not issues with the egg itself. We couldn’t tell if it was something to do with the force of the two eggs together which made one break and one not, but it was fascinating. We learned the first time that you can definitely shake the eggs too much, yet our first egg still never cracked, even with all that shaking. When the timer went off to indicate the 30 minutes had ended, we had gone through our six shaken eggs with only one casualty of the six which was a result of a little bit too much shaking. We brought in the covered container and uncovered it. Inside, the eggs were still hot. I began to peel them, which would be the ultimate test: would they peel easily or would they be a big mess? The end result: the eggs peeled perfectly! The shells came right off and the eggs remained unscathed underneath the shell. No messy, pitted egg white disaster. It was amazing to see just how easily the shells came off. Ultimately, we decided that although both methods worked, it was easier to do the refrigeration method: 12 minutes to boil and 30 minutes in a covered container in the fridge. No rinsing in cold water, no over-boiling. This was not something we had planned to do, it was a completely spontaneous kitchen science experiment, but it was a fun one and it shows just how much science does go into cooking, and how fun cooking can be. As with any science experiment, you need to do it many times to see if your results are reliable, so we will be trying this out the next few times we make hard boiled eggs, but we do hope we have found a great solution. Do you have any tried and true tricks for ensuring a great, easy-to-peel hard boiled egg? Leave them for me in the comments! I ended up making these two weeks in a row, and the second week I doubled the recipe. One afternoon I was scoping the internet, looking for a good after school snack to leave for my kids when I went to work that day. I found a recipe for “Breakfast Cookies with Peanut Butter, Banana and Chocolate Granola” from the Taste and Tell blog. I had everything for it except the chocolate granola, but I had plain granola and chocolate chips. I decided to modify the recipe to work for the ingredients I had. These are hearty cookies, perfect for an after school snack, and definitely perfect for breakfast on the run. My oldest daughter gets on the school bus by 7:00 am and can’t stomach a whole lot that early in the morning, but she’d take two of these in a bag with her each morning for when she did start to get hungry later on. Our school system has been inundated with hours and hours of PARCC standardized testing, and it often takes place first thing in the morning, so the last thing I wanted was a kid taking two or three hours of testing on an empty stomach every day. These cookies were definitely the right answer to that problem. My husband takes breakfast to go every day also, and these were a nice change of pace from a bagel, yogurt, oatmeal or cereal, which he usually eats, and if he wanted, he could save them for a snack later in the day when he’s working after school gets out. These were such a hit, I made them again the following week, and I doubled the recipe to make twice as many. This time, when I opened the box of granola, it was a cinnamon raisin variety rather than just plain granola, but I gave it a try. Even my daughter who doesn’t like raisins, ate them without even noticing they were in there. I think it was the chocolate chips that saved the day that time. As we’re finishing up our spring break now, we’re heading back into several more weeks of testing when we go back to school, for both NECAP and PARCC, so I’ll be whipping up a couple more batches of these cookies. I’ve been tempted to make enough to freeze, but so far there’s never been any extras left to freeze! I hope you’ll give them a try and pay a visit to the Taste and Tell blog! Here is her recipe, along with my ingredient modification instructions. 1) Preheat the oven to 375 F. Line two baking sheets with parchment paper. 2) In a bowl, or the bowl of a stand mixer, combine the peanut butter, banana and brown sugar and beat until light and fluffy, 2-3 minutes. Beat in the egg and vanilla extract, scraping down the sides of the bowl as necessary. 3) In another bowl, combine the flour, baking soda, and salt. Stir into the creamed mixture. Stir in the granola. 4) Form balls of dough, about 3 tablespoons each. Place at least 2 inches apart on the prepared baking sheets. Use the bottom of a measuring cup to slightly flatten each ball of dough.